I was approached by one of my clients early summer this year and was asked if I would be interested in creating a 60th Wedding Anniversary present for her mother. I thought about this opportunity and to be honest, this would be my first 60th anniversary commission with a possible diamond focus, so I embraced this opportunity. I have designed and created previously both Ruby (40th) and Golden (50th) Anniversary bespoke commissions with clients. I replied a big “Yes” and explained how grateful I was to be commissioned to be part of this amazing celebration. I was given her father’s mobile number, with view to schedule a chat but it was imminent this might be difficult as her father had to ensure that his wife would be out of earshot otherwise the cat would be let out of the bag and spoil the surprise! Prior to scheduled call, I was briefed by his daughter that her mother was a passionate piano teacher and immediately thought of musical notes such as treble clefs and bass clefs and a befitting commission could possibly be a bespoke designed brooch. I suggested the idea of a brooch with diamond and it was agreed this commission would be ideal. I managed to speak with my client at an opportune moment and he was in agreement with the design concept. We eventually met and I showed some design ideas including a previous design below for a pendant which could be adapted to a brooch, see below. I thought this design would be nicely finished, if we introduced a brilliant cut diamond set to a platinum collet to befit this 60th commission. The base metal would be in 18ct yellow gold with pave diamond setting to the centre of brooch. My client was now eager and excited to see the end result and I only had three weeks to complete the commission. The next stage was to raise CAD design, lower right which was agreed by client. My workshop then printed the wax on the 3D Solidscape printer and the wax was then sent for casting and then returned to my workshop ten days later. The mount was then cleaned up, the bar and pin was assembled to back of brooch and then pre-polished ready for setting of all diamonds. The brooch was then hallmarked and finished with a final polish and presented in a lovely black box. I personally delivered brooch to my client who presented brooch to his wife in good time for their Diamond Anniversary and was told that she was absolutely delighted. I attended their granddaughter’s wedding in September and had the pleasure of meeting my client’s wife who was wearing the brooch on her lapel which looked stunning. The eternity ring – how do I choose the ideal ring? https://grahamtom.com/wp-content/uploads/2017/11/IMG_6835b.jpg 1361 2022 grahamtom https://grahamtom.com/wp-content/uploads/2016/10/grahamtom-logo-300x212.jpg grahamtom2017-11-27 09:08:422017-11-27 18:06:28The eternity ring - how do I choose the ideal ring? Hallmarking can be traced back to the 13th century where Edward 1 decreed a new law that “no piece of silver should depart from a worker’s hands until assayed and marked with a leopard’s head”. To clarify this law today 800 years hence, is to state, that any noble metal that is un-hallmarked can not be described as a noble metal without having the fineness of metal confirmed by an assay office. In this case, the leopard’s head is the assay mark of London, one of four assay offices in the UK. Hallmarking is an important requisite, as jewellery manufacture today necessitates the use of precious metals including platinum, gold, palladium and silver not in their respective 100% purest form. Most metals are alloyed with other metals for purpose of strengthening the base metal and a British hallmark offers peace of mind for the consumer on the basis of three compulsory requirements. Where do I find the hallmark? The UK hallmarking regulations have become one of the most stringent in the world thanks to the 1973 Hallmarking Act and a flagrant misuse of a description of an un-hallmarked article by any person in the trade or business will be guilty of an offence which can result in a prison sentence! The Hallmarking Act does protect the consumer, as the UK online jewellery trade today is flooded with imported jewellery manufactured in Asia and the Far East which on importation to UK may not be verified. To safeguard the consumer, if a jeweller sells an imported item such as a platinum ring then the item must be properly hallmarked with minimum three marks, otherwise the item can not be described as platinum, but can only be described as a ring in white! So please be aware of proper hallmarking on your next jewellery purchase and do ask your jeweller to show you hallmark for peace of mind! Pippa Middleton is now officially engaged to hedge fund manager James Matthews who took the traditional route with permission sought from her parents. I wish them a happy engagement but to be frank, the most intriguing part of their announcement was more the art deco vintage style of engagement ring and choice of Asscher cut diamond which created much speculation as to the cost of engagement ring. I want to buy my partner a ring but have no idea of her finger size, what do I do? This is a typical question I have to address with him when it comes to designing a ring for her as finger sizing is very important because if a ring size is too big or too small, ring will either slide round, slip off or will feel tight and uncomfortable to wear. The solution is to establish what hand and what finger, ring should sit and have the correct sizing at the design stage of ring. If finger sizing is unknown, there are some solutions from the simple to the extreme. Have a read. Asking a friend to help by letting her try on one of her best friend’s engagement, eternity or dress ring to see if the diamonds or gemstones suit her finger shape. Her friend may have a similar finger size so this could be a start and could provide a solution without letting the cat out of the bag. If you try asking her family then the cat really is out of the bag as if you have been together a while her parents and siblings may start talking and your partner may be congratulated without an inkling of what is going on! This solution is very popular with clients as she may have some favorite rings she wears daily or on a rotation basis. This would require some detective work with critical timing. Make sure she has gone to work for day so you can borrow ring for the day and take to your local jeweller for sizing. Do ensure ring is returned to original place where you located it on same day as otherwise she will notice something is amiss! When your partner has popped out for the weekly shop, find a piece of paper and a fine (micro) pen with 0.5mm nib and pull out from jewellery box a ring she wears on correct finger. Then place ring on paper and draw the outline of inside diameter of ring as per illustration above. Please ensure inside diameter and NOT circumference. 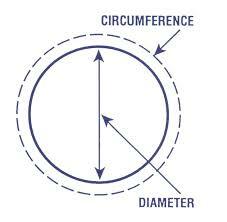 Your local jeweller can then measure internal diameter which should be fairly accurate. It must be the right finger for this to work as there can be a differential of half to two sizes for same finger on other hand! This solution can work but not always as is dependent on size of your finger! Again, action this when she is not at home. You can pop her ring on one of your fingers and then go to your local jeweller who can size relevant finger. Quite often her engagement finger size emulates your pinkie finger but not if you are small or heavy handed! This solution is guaranteed to work only if your partner is a heavy sleeper! You can buy online here from Amazon a plastic finger sizer for a few pounds and then slide sizer on her finger when she really is in land of nod! DO NOT TRY THIS IF SHE IS A LIGHT SLEEPER as if she wakes up she may get a fright! A client of mine this Summer actioned this solution with a great result with an accurate finger sizing and she really was a deep sleeper! Have a look at photo below, she never felt a thing! 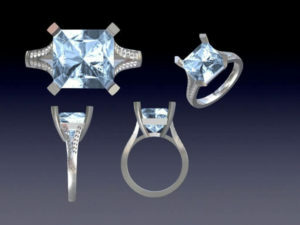 Rings come in all differing widths of metal ranging from 1.50mm considered narrow width to 10.00mm + for large cocktail rings. Please note that greater widths of metal will mean ring will sit tighter on finger than a narrow width of metal. Sizing of fingers can vary seasonally as the warmer summer weather can make finger swell and in winter with cold weather, fingers can shrink and ring can loosen. Best solution is to ask your local jeweller for advice and in event you try any of above solutions and ring does not fit and sit comfortably, your local jeweller should offer a 24 hour ring sizing service. https://grahamtom.com/wp-content/uploads/2016/11/Blog-2-Size-Sizing.jpg 1000 1000 grahamtom https://grahamtom.com/wp-content/uploads/2016/10/grahamtom-logo-300x212.jpg grahamtom2016-11-14 10:36:482016-11-14 12:46:55I want to buy my partner a ring but have no idea of her finger size, what do I do? Cut of diamond is the most critical of the 4C’s, the variables governing value of diamond and refers to the proportions, symmetry and polish of diamond. Diamonds are a transparent gemstone and dependent on the size of facets to diamond, interacts with transmitted light to create internally reflective, dispersive, refractive and scintillation brilliance. The term cut must not be confused with the actual shape of diamond which refers to the outline of varying shapes of diamond such as Round Brilliant, Cushion, Emerald, Asscher and Princess cut diamond. The term cut of diamond refers to the only variable of the 4C’s which is influenced by hand, as Carat weight, Colour and Clarity are all governed by nature via the billion year growth process of rough diamond. To understand cut in more detail, the polisher has a crucial role in realising the ideal diamond cut which is decided by the original shape of the rough diamond, location of internal flaws or inclusions, the preservation of carat weight and popularity of certain shapes amongst consumers. The polisher must consider each of these variables before proceeding. The polisher has to decide whether to yield from the rough crystal above, the ideal proportions for a diamond to realise maximum brilliance , as per Ideal cut above or compromise with a spreadier, heavier weighted Standard cut with a smaller crown and weaker brilliance. So diamonds are actually cut to preserve as much weight as possible as a heavier carat weight could be more attractive to a consumer however the cost per stone increases and the cut grade would be weaker due to deviation from ideal proportions. If the polisher adhered to ideal proportions a better cut grade would be issued by a grading laboratory. Cut grade is so important as it allows the buyer to identify diamonds that have not been cut to ideal proportions. A diamond cut has to have harmony between diameter, crown height, depth, crown, pavilion angles and girdle, referred to as proportions. 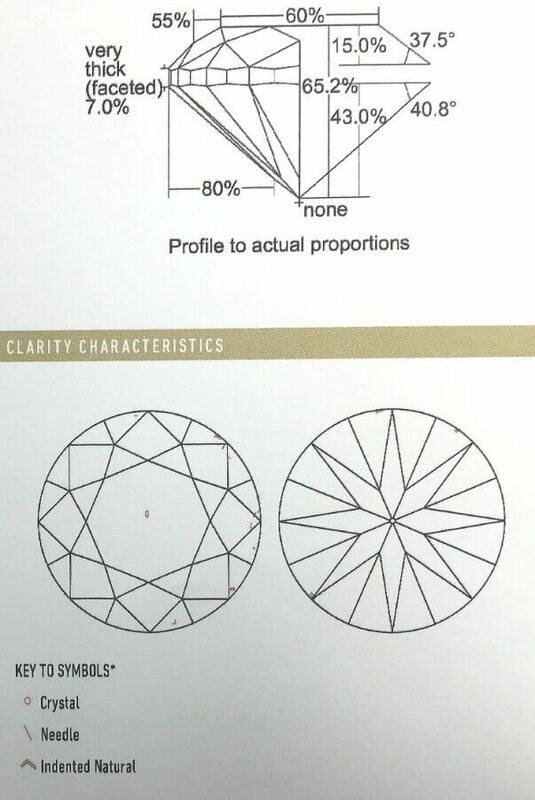 The table and depth percentages both represent a percentage of the girdle diameter and also affects how light travels within diamond which can impact on the brilliance of diamond. If you revert to ideal cut above the ideal proportions allow light to strike each pavilion facet at an angle to reflect back to crown and light refracts on exit enabling dispersive brilliance. If you revert to cut too deep light strikes the first pavilion facet at an angle sharp enough to reflect to the second pavilion. However, the light strikes the second pavilion at too low an angle, causing the light to refract through the bottom of the diamond, a diamond will appear dull or dark. If you revert to cut too shallow, light strikes the first pavilion facet at a low angle and passes through facet and refracts through bottom of diamond, a shallow cut diamond will lose brilliance. A well proportioned diamond will have each facet properly placed and angled so as to maximize the amount of light that reflects back out of the crown of the diamond to viewer. This reflected light is called reflected internal, dispersive (fire) and scintillation brilliance (sparkle). To understand diamond cut we all know that diamonds are renowned for their ability to transmit light and sparkle. GIA laboratory services take a view a diamond’s cut grade is really about how well a diamond’s facets interact with light. Brightness: Internal and external white light reflected from a diamond. Fire: The scattering of white light into all the colors of the rainbow. GIA’s diamond cut grade also takes into account the design and craftsmanship of the diamond, including its weight relative to its diameter, its girdle thickness which affects its durability, the symmetry of its facet arrangement, and the quality of polish on those facets. These two variables are called the finish of diamond which I will address in another blog. GIA employs cut grades ranging from Excellent/Very Good/Good/Fair/Poor. Excellent Cut is granted to diamonds with the highest level of brightness, fire and scintillation while the lower gradings of cut are granted to stones with poorer light reflection, fire and scintillation. GIA only grade cut for round brilliant cut diamonds and not fancy cut diamonds due to the nuances in proportions and measurements which can vary considerably. At Graham Tom, we only sell diamonds for our bespoke jewellery services accompanied with either a GIA dossier or a GIA grading report as we believe in the consistency and accuracy of GIA’s grading standards. Seal engraving originated back to the Old Testament, when wax from a lit candle was dripped onto a flap closing a document which was then stamped with an inscribed stem called a seal. 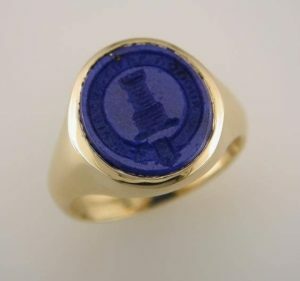 Seals were literally used to seal deals and communicate rank and status. A gold signet ring or fob signet for ladies became more widely used in the 17th and 18th centuries and an unbroken seal confirmed authenticity of documents from noblemen and letters of a more light-hearted or personal nature. 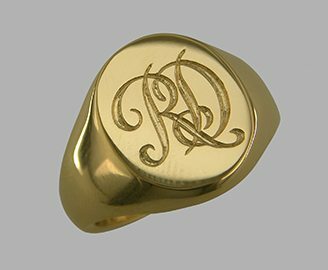 Today, signet rings are very popular and fashionable with clients and seals can be engraved in all the precious metals including the most popular 18ct yellow gold, 18ct white and rose gold and platinum. Seals can also be engraved into stone, the most popular being Carnelian, Lapis and Sardonyx. 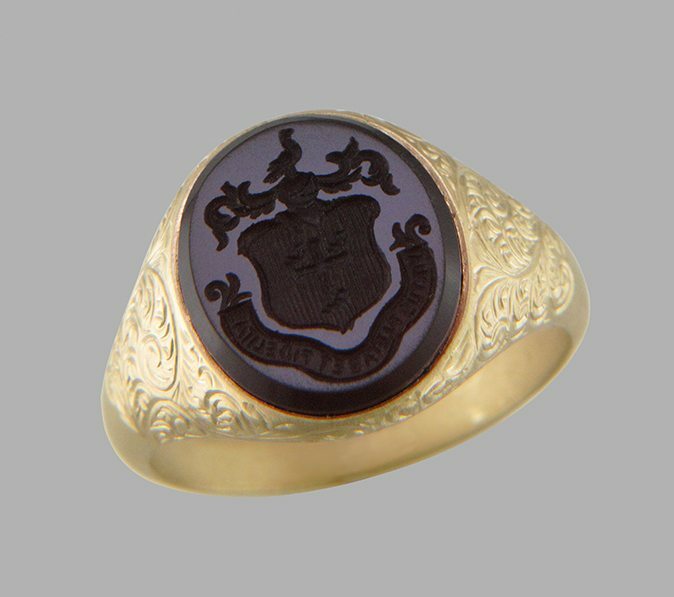 Graham Tom will cut by hand your personal design, initials, crest or coat of arms in reverse creating a negative which creates a positive impression in a wax seal or your personal design can be cut for show. 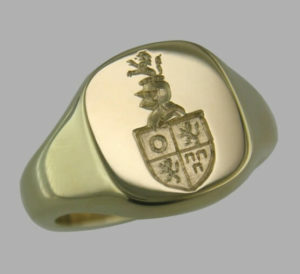 A variety of shaped signet rings are available with the most popular being oval or cushion shaped. Standard stock sizes are available in differing weights which are all cast and a bespoke service is available to create any shape or designated preferred weight. Please contact Graham Tom for more information. If you require any help with any of our services or have any other concerns I will be delighted to assist you. Is your diamond on a GIA report a borderline stone? Several clients have contacted me recently to raise a valuation for insurance purposes. They come into the Bourse waving their GIA reports with a satisfied smile. They explained that their bridal focal diamond was bought online at a great discount off Rapaport list or from a boutique in a mall in the Emirates at a great price. It is at this point alarm bells start to ring before I even start to gauge diamond measurements, proportions and assess mount. Why you may ask? The diamond market currently is in a quandary where the price of rough diamonds offered at tenders/auctions are too high for diamond manufacturers to yield a profit and “sights” are being deferred to later dates. Polished diamond manufacturers are loading their inventory with very tight margins onto Rapnet, the largest diamond trading platform targeting wholesalers, diamond brokers and retailers. You then have an open market of willing buyers for bridal and lifestyle purchases of diamond jewellery with an eclectic mix of sellers of diamond jewellery all vying to be of service with access to Rapnet , including e-tailers, bricks and mortar retailers and boutique operators. But the market can arguably be closed for the diamond manufacturers especially in India and China as there is no liquidity to purchase goods and margins are being squeezed. As a result these diamond manufacturers try and maximise yield from the rough diamonds which are then sent off for grading to GIA laboratories. But when it comes to “make” of diamond which manifests as Cut, Polish and Symmetry on GIA reports, these diamonds are actually borderline stones. I say borderline because the ideal measurements and proportions of an ideal cut can be compromised. For example above, if you take two 1.00ct F/VS1 carat brilliant cuts,(see reports 1a and 2a top) the diameter on an ideal cut should range from 6.35mm to 6.50mm (see larger spread right stone 1b) but a borderline diamond on a GIA report can easily have a diameter of 6.15mm-6.25mm and will appear considerably smaller against an ideal cut (see left stone 1b) These borderline diamonds also have a very thick girdle (see first stone to left 2b ) which can affect brilliance of diamond. The proportions on reports below left also highlight how deep the stone is with measurements which have been compromised. Borderline diamonds trade at a very significant discount and are attractive to willing buyers on a tight budget. You also need to factor in clarity as quite often if a buyer requested an SI1 or SI2 diamond, a borderline diamond will have the inclusions to centre of table which can be seen by naked eye and not scattered to girdle or to pavilion. Again these stones trade at a very significant discount. Colour can also be borderline , remember diamond grading in all laboratories is subjective and not definitive and represent an opinion of the grader. My point here is that in an ideal scenario, the willing buyer has choice where to purchase diamond jewellery. The buyer today is better educated with the 4C’s and information is freely conveyed online so please ensure you do your homework before you move forward. Make sure you buy from a reputable jeweller who has experience in the industry and do not get taken in with an offer of diamond at a cheap price online or in the malls as you will regret your borderline stone purchase on a GIA report should you wish sell it a later date. https://grahamtom.com/wp-content/uploads/2015/11/Both-diamonds-identical-weight-with-different-Spread-711x321.jpg 321 711 grahamtom https://grahamtom.com/wp-content/uploads/2016/10/grahamtom-logo-300x212.jpg grahamtom2015-11-09 13:16:172016-11-14 09:30:58Is your diamond on a GIA report a borderline stone? A client contacted me to view several items of tired diamond and gemset jewellery she had not worn for ages with a brief to refresh into new contemporary mounts so she could enjoy wearing them again. When we met, of all the jewellery viewed one piece stood out above all items. 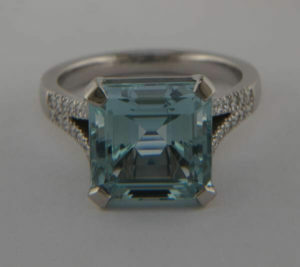 It was a significant sized square step cut octagon aquamarine set in a heavy looking collet with some channel set diamond baguette diamonds to shank. There were a few baguettes missing and damaged. What struck me was the state of aquamarine which over the years had sustained abraded facets with some minor chips to girdle with some scratch marks to crown and pavilion. However, there was no real significant damage to stone. I put this down to hardness of this variety gemstone which is 8 on Moh scale which is a durable gemstone within the Beryl species. 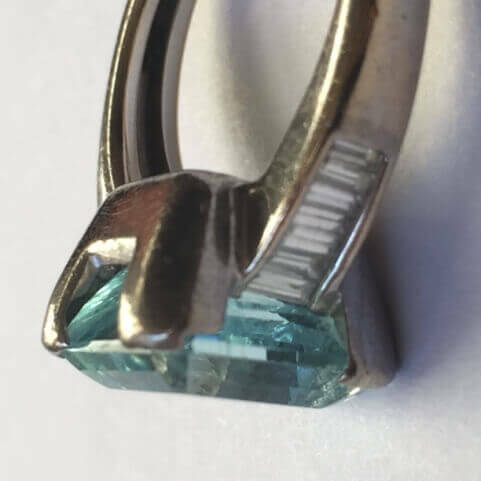 I recommended to have the aquamarine repolished with a view to removing the chips and the abraded facet edges and in doing so this would bring back lustre to the gemstone. Lustre being the quality and quantity of reflected light from surface of gemstone. The result as a significantly improved gemstone with amazing lustre with very little weight loss. Please see below. I will add at this stage, I had not shown improved stone to client as at initial meeting when we discussed redesign for new mount my client wanted to enjoy the surprise on presentation. 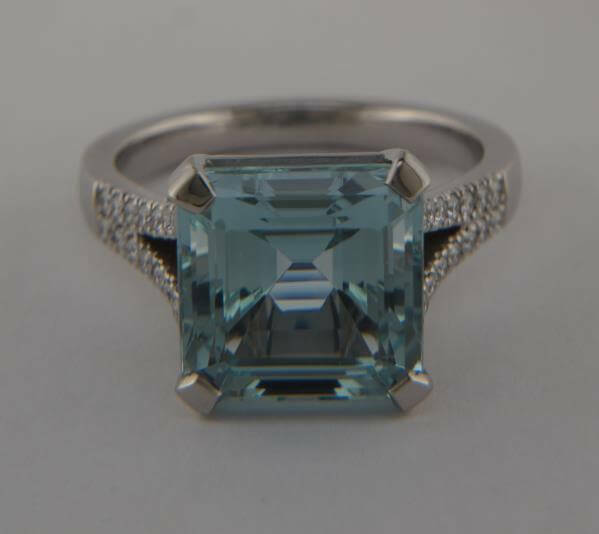 I redesigned new mount on CAD which had centre focus of aquamarine with the stone set in a lighter collet with flat claws and mounted to a split shank micropave set with diamonds. Here was the result below and a very happy client. If you are thinking of going away this Christmas for some sun, fun and retail therapy especially for diamonds and gemstone jewellery, spare a few minutes and read my article on the various treatments on the big four gems, diamond, ruby, emerald and sapphire. I have only written a brief synopsis on each treatment, but for further information, please contact me. Enhancement of gemstones with varying treatments have existed for centuries. In addition to enhancing their appearance , the process may also improve or lessen the gemstone’s durability. The treatments are not always apparent and are sometimes difficult to distinguish and any party selling an enhanced gemstone in UK according to CIBJO guidelines must disclose the treatment method and must be mentioned on supportive paperwork. The image above shows Diamond clarity enhancement –Fracture filling: before (left) and after (right). Enhancement primarily improves colour and clarity of gemstone but at same time recent demand for unheated sapphires and rubies have caused a price increase of as much as 50%-100% for unheated material. In most cases heating enhances the gemstone to make it more attractive for a buyer. Some treatments are not permanent and laboratories will not issue a report if treatment is not permanent. Surface coating – Applying a thin film of synthetic diamond to the surface of a diamond simulant, giving it certain characteristics of a real diamond. This method is not permanent. Laser drilling – A method of removing significant inclusions by lasering into diamond and burning away inclusion. Fracture filling – After lasering diamond and removing inclusion, a glass compound with same refractive index of diamond is injected to make inclusion less apparent. This method is not permanent and controversial. Irradiation & Annealing – Neutron and electron bombardment of diamond creating colour centres and with additional heating creates an assortment of coloured diamond. HPHT – High pressure high temperature treatment removes colour or adds colour dependent on diamond type. Heating – A method of exposing gem to varying high temperatures for the purpose of altering colour and improving clarity. Lattice Diffusion – The use of element Beryllium during heat treatment to penetrate the crystal lattice of Ruby to improve colour. Glass filling – This method represents ruby that is heavily treated to improve transparency and is very controversial as treatment is unstable resulting in damaged stones. Fracture filling – This method employs artificial resins such as polymer to hide fractures with disastrous results if placed in ultrasonic cleaning equipment. Oiling – This method is accepted in trade with use of essential oils to hide fractures within gemstone. 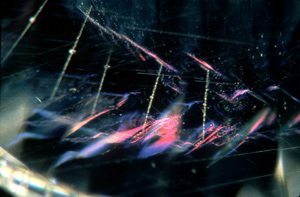 Lattice Diffusion – The use of element Beryllium during heat treatment to penetrate the crystal lattice of sapphire to improve colour. My advice is always to buy from a reputable jeweller with a track record and be wary of pricing as treated stones should trade at a lesser price than natural gemstones. If you do buy abroad and want to buy a significant sized natural gemstone then make sure it is accompanied by a reliable laboratory report. The big four laboratories are GIA, SSEF, Gubelin and Swiss Gemological Laboratory. For durability of enhanced gemstones, please download my pdf How to Clean Your Jewellery.